The Blurb says: Winner of the 2016 EDGAR, AGATHA, MACAVITY and H.R.F.KEATING crime writing awards, this real-life detective story investigates how Agatha Christie and colleagues in a mysterious literary club transformed crime fiction. Detective stories of the Twenties and Thirties have long been stereotyped as cosily conventional. Nothing could be further from the truth. The Golden Age of Murder tells for the first time the extraordinary story of British detective fiction between the two World Wars. A gripping real-life detective story, it investigates how Dorothy L. Sayers, Anthony Berkeley, Agatha Christie and their colleagues in the mysterious Detection Club transformed crime fiction. Their work cast new light on unsolved murders whilst hiding clues to their authors’ darkest secrets, and their complex and sometimes bizarre private lives. The Blurb says: Michael and Francis are the bright, ambitious sons of Trinidadian immigrants. Coming of age in The Park, a cluster of houses and towers in the disparaged outskirts of a sprawling city, the brothers battle against the careless prejudices and low expectations that confront them on a daily basis. While Francis dreams of a future in music, Michael’s dreams are of Aisha, the smartest girl in their school, whose eyes are firmly set on a life elsewhere. But the bright hopes of all three are violently, irrevocably thwarted by a tragic event. Beautifully written and extraordinarily powerful, Brother is a novel of deep humanity which provides a profound insight into love, family, opportunity and grief. The Blurb says: The four uncanny and terrifying tales contained between these covers are all linked by their reference to a certain notorious play, a cursed, forbidden play that has spread like a contagion across the world, a play in which the second act reveals truths so terrible, and so beautiful, that it drives all who read it to lunatic despair: The King in Yellow. These stories are some of the most thrilling ever written in the field of weird fiction. Since their first publication in 1895 they have become cult classics, influencing many writers from the renowned master of cosmic horror H. P. Lovecraft to the creators of HBO’s True Detective. The Blurb says: Fifty-something Shona is a proud former pupil of the Marcia Blaine School for Girls, but has a deep loathing for The Prime of Miss Jean Brodie, which she thinks gives her alma mater a bad name. Impeccably educated and an accomplished martial artist, linguist and musician, Shona is thrilled when selected by Marcia Blaine herself to travel back in time for a one-week mission in 19th century Russia: to pair up the beautiful, shy, orphaned heiress Lidia Ivanovna with Sasha, a gorgeous young man of unexplained origins. But, despite all her accomplishments and good intentions, Shona might well have got the wrong end of the stick about her mission. As the body count rises, will she discover in time just who the real villain is? NB All blurbs taken from Goodreads. Poor little Tommy! I do hope you are okay up there in the snow. The weather is rather grim here but we can still get about (just). Mind you, I won’t be venturing very far this week. I blame Putin! This is his snow, after all. Oh my gosh I hope you are all okay!! Keep warm – the best way to do this is to insulate from within with chocolate and wine 😊 stay safe, my friend. I hope you have a chocolate stash to last you through the snow! Can you get out at all? All of these books appeal, but will wait for your reviews to confirm. I am rather wishing I’d paid more attention and done a big shop before it began. Still, as T&T have pointed out, at least we have plenty of cat food… Haha – if Tommy didn’t have those blobs he’d have disappeared entirely! A good-looking batch of books – I have high hopes for all of them! I’m not sure whether to sympathise or be glad you have such lovely neighbours! Could you also please make sure that all that snow is gone before I get to the UK. I understand that is a big ask so perhaps just Cornwall to start with. Thank you. Haha – yes, I’ll pop down there with my trusty snow shovel and clear it. I’ll have to walk down, mind you, since there’s no chance of digging the car out any time soon, so it may take me a day or two… When’s your trip? Of course Tommy uses you for a warming blanket, FictionFan. Humans are made to do/be whatever cats want. As to the books, I’m really glad you got The Golden Age of Murder. It’s a good ‘un, and with Edwards at the helm, you know you’re getting quality stuff. Stay warm! Something will have to be done about Martin Edwards – he’s a menace to TBRs everywhere! The King in Yellow is one of those books that is continually referred to in fantasy – now might be the time to read it. I know, he really needs to be banned by law! Interesting! I’d never heard of it, but the blurb appealed and it turns out it’s incredibly short. Happy Birthday, Teddy! Haha – they show no mercy, do they? Tuppence hasn’t been over the door since it started, but Tommy keeps going out and being surprised by it all over again. Thank goodness for his blobs! The Golden Age of Murder, definitely! Though I am intrigued by the Miss Blaine book. Both look good, don’t they? We’re having one of our worst snow storms ever – they’ve declared our first ever red warning zone, and guess who’s in it? The world is gradually disappearing… but what’s happened to kids today? Not a single snowman in the street yet – I may have to build one myself! Poor Tommy Tell him he looks dashing in all that snow — kind of like a Christmas postcard (and here the calendar says ‘March’!!) You’ve got some goodies on today’s list! The Golden Age of Murder sounds very good. I hope the snow didn’t catch you unprepared (without tea and other necessities)! Great. Sounds like the perfect diet! Anyway, to the tottering tbr. A drop of two is splendid – well done. Mine has now gone up by one since I simply must read Miss Blaine’s Prefect which sounds brilliant. I just need to get around to Miss Jean… first. It’s on my Classics Club list and I really want to read it so this is yet another nudge to get on with it. I loved The Prime, so I’m even more enthusiastic to read Miss Blaine now. Saraband always seem to find such original books and authors. Fingers crossed! Poor Tommy what a shock for him – we have about 1 cm of snow here! I have The Golden Age of Murder on my TBR already but I am tempted by Miss Blaine’s Prefect… I need to read The Prime of Miss Jean Brodie first though. Oh, you’re lucky! I don’t ever remember us getting this much before – in some parts of the garden where it’s caught against fences and things, it’s drifted to well over two feet. Even on the open stretches it must be getting close to a foot deep. *laughs* Tommy was so shocked! So much snow! We’ve gotten rain, rain, rain, all February here in TN. I’m ready for spring and sunny days! These all look interesting, but since Brother is already on my TBR (courtesy of Naomi and Anne) you didn’t get me this week -ha ha! 😉 Good thing, because all my library holds are now coming in and I’m buried in books! I wonder the same thing about snowmen – there just aren’t as many as there used to be! Oohhh pressure is on! I hope you really like Brother-and thanks for the shout out 🙂 The Martin Edwards looks really good so I’m looking forward to your review on that one. Yay for Brother! But all of these look good. And how perfect that you just read The Prime of Miss Jean Brodie. Plus time travel. I hope it’s good! 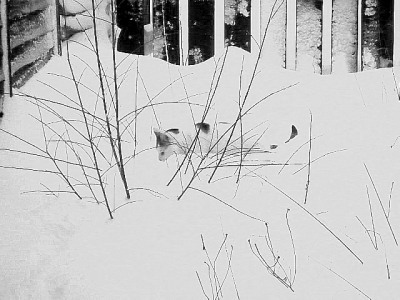 I love watching cats in the deep snow. Some of our cats have only tolerated it, but others have loved it – leaping and bounding around. Tommy looks a little wary. I’ll be shocked if you don’t end up adding any books. Good luck! I am very tempted by The Golden Age of Murder and Miss Blaine’s Prefect 😀 Happy reading!